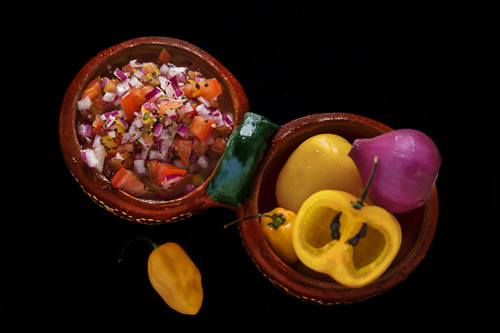 Pico de Gallo Salsa “Yucatecan Style"
This salsa is a variation of the traditional salsa pico de gallo. The difference is that it is typical from the Yucatan peninsula and for this reason typical Yucatecan ingredients are used like the habanero pepper, the manzano pepper and the red onion . The salsa is prepared with tomato, red onion, chilies, bitter orange, oregano and more ingredients. All these ingredients are chopped, seasoned and mixed. The salsa’s flavor is fresh and contrasting as it combines strong and spicy flavors with sweet and fruity notes – be very careful because it is extremely spicy. This salsa is perfect to put to Yucatecan dishes like the cochinita pibil or some tasty panuchos, although you can also use it to put on your favorite antojitos. If you can cut ingredients and mix them you can make this salsa. Be careful, in this recipe you are going to work with the habanero pepper and it is one of the most spicy chilies in the world. Therefore don’t touch your eyes while preparing the salsa. To obtain an authentic Yucatecan flavor bitter orange is used but if you don’t get it you can substitute it for 2 tablespoons of white vinegar and the juice of 1 lime. This salsa is going to be ready in 5 minutes . Remove the seeds and the veins of 1 habanero pepper and 1 manzano pepper. If you want to transform your salsa into fire leave the seeds and the veins of the chilies. Finely chop the habanero pepper and the manzano pepper with the ones you worked; then put them in a bowl and reserve. Dice 1/2 red onion and 3 tomatoes; upon completion pass them to a bowl. Mix very well the Yucatecan style pico de gallo with a mixing spatula. Recommendation: If you feel that the salsa is too spicy a refreshing Mexican beverage will urgently be needed. ✒ Art and the Mexican Food. ✒ Human Sacrifices and Mexican Food.